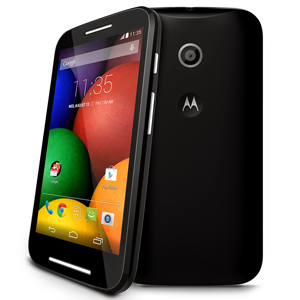 The Moto E is a low end Android device by Motorola. The Moto E was launched in May 2014. The device features a 4.3" LCD display, with a resolution of 960x540. It's powered by a Qualcomm Snapdragon 200 dual-core 1.2GHz processor and 1GB of RAM. It has 4GB internal storage, with a microSD slot capable of up to 32GB. The Moto E has a 5MP camera and runs on Android 4.4.2. All this is backed by a 1980mAh battery. All times are GMT +3. The time now is 02:59.